A reliable and responsive alternate dispute resolution system is essential for rapidly developing countries like India. While several efforts have been made to do the same, it was only last year that the Arbitration and Conciliation Act, 1996 was amended through a judicial push and legislative reforms. The amendment strives to bring the Indian arbitration mechanism at par with the international norms and rules. Geared in the same spirit, critical issues, experience of international arbitration and the future roadmap of strengthening arbitration in India were discussed at the conference ‘National Initiative towards Strengthening Arbitration and Enforcement in India’. 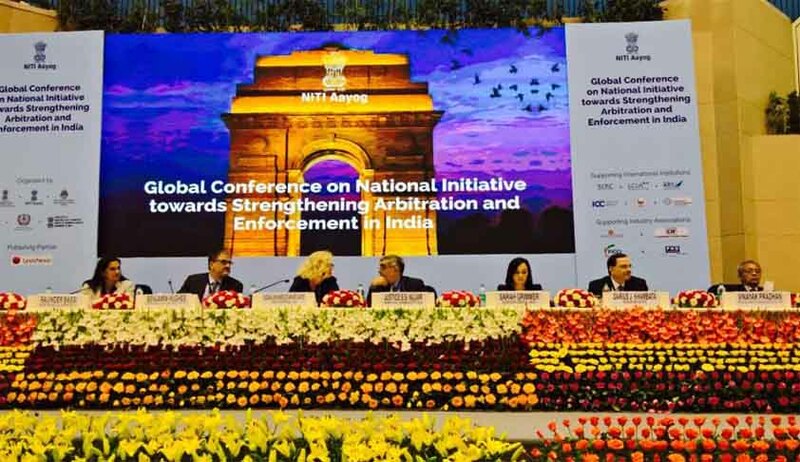 Organised by the NITI Aayog, the three-day conference in New Delhi was inaugurated by President Pranab Mukherjee on Friday. Supported by six international arbitration institutions, industry associations and legal fraternity of India, the conference through its intense brainstorming sessions aims to promote commercial arbitration in India. Speaking on Friday, Finance Minister Arun Jaitely had hailed the provision of Section 29 and had said that an expeditious arbitration mechanism would augment foreign investment in India. Taking up the good, bad and ugly of the Arbitration Act in India, the second day of the conference saw major discussions on Section 29 and most experts differed with the Finance Minister on the subject. It was unanimously agreed by the judges, litigants, arbitrators and stakeholders that the Section should be revisited and revised. Commenting on Section 29, former Chief Justice of India Justice RC Lahoti said, "The amendment will not work in India. As per the amendment, the limitation period begins from the day the arbitration tribunal becomes functional. It has to be realised that six months only go in completing pleadings. What should ideally be the case is to begin the limitation period from the day the trial begins." "Time limit should not take away the essence of arbitration. Time limit has to be fair and reasonable else the doctrine of due processes would be hampered in an effort to adhere to rigid time frames," said Dr Mool Chand Sharma, former member of the Law Commission of India. Several other lacunae of arbitration in India also came through during the discussions. One aspect pointed out was the lack of adequate infrastructure. Panelists pointed that with only one fully functional arbitration centre in India, the Mumbai Centre for International Arbitration (MCIA), efforts have to be made to develop other centres as well. It was suggested that mechanism for online arbitration and e-filing should also be provided to the investors and clients. Senior advocate Abhishek Manu Singhvi said, "Adequate infrastructure should not mean just brick and mortar. It should depend on efficient operationalisation." The other factor was developing an ecosystem for arbitration and forming a specialised bar of arbitrators. The establishment of a specialised bar would encourage companies to come to India to arbitrate. The lack of specialised arbitrators has been a crucial reason behind why companies have been unable to embrace arbitration in India. The conference will continue on Sunday where Prime Minister Narendra Modi is expected to speak. It is hoped that the suggestions and creative criticism received through the conference would help the country achieve the panacea imagined for arbitration in India.